Independent Directions to this Site: From Highway 417, 39 km east of Ottawa, take the Limoges exit (79) and go NNW for 4.4 km on Limoges Road (CR 5), through the town of Limoges to the junction of this road with Regional Roads 8 and 37. Follow the right hand curve on Regional 37 or the Saumure/Clarence-Cambridge Boundary Road northeast for 0.9 km to where Saumure turns left. Then continue straight northeast on the Clarence-Cambridge Boundary Road for an additional 7.9 km to Perron Road South of Clarence-Cambridge Boundary Road. Turn right or SSE onto Perron Road. Larose Forest Loop Route Directions: From Croche Road at the Clarence-Cambridge Boundary Road, go east on the Clarence-Cambridge Boundary Road for 1.2 km to Perron Road. Turn right or SSE onto Perron Road South of Clarence-Cambridge Boundary Road. Map of the Perron Road South of Clarence-Cambridge Boundary Road Area Click on other site numbers to go to their pages. 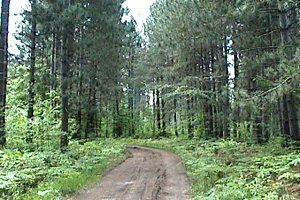 Site Description and Birding Information: Perron Road or Trail South of Clarence-Cambridge Boundary Road is a dirt track giving access to the forested area in the southwestern portion of the Larose Forest. It is possible that this track could be driven, with caution and a 4-wheel drive vehicle, during drier times of year; but it is obvious that it would be better to bird this "trail" on foot. There is a good mix of deciduous and coniferous forest with scattered wooded swamplands along the way. About 0.4 km from the Clarence-Cambridge Boundary Road, the road/trail bends right or southeast and continues a further 1.1 km to a side trail to the left that cuts across to Route 100W. To stay on the Perron Trail continue straight southeast for a further 1.3 km where you will reach Route 100W. About halfway along this last stretch a side trail heads west toward the Gagnon Trail. At Route 100W you could head ENE on Route 100W and in 3.6 km reach Nile Mile Road (or Neuf-Milles Road) and the Route 100 Trail at Nine Mile Road site. To stay on the Perron Trail cross Route 100W and go 1.3 km to a north-south trail, turn right or south on it 0.3 km, and then turn left or ENE to follow Perron Road/Trail for 2.5 km to Nile Mile Road (or Neuf-Milles Road) and the Nine Mile Road at Perron Road site. The area can be quite wet in any season but winter, so boots are recommended in warmer months. Insects can be bothersome at that time too. As well as being good for birding, especially in migration, this trail is excellent all summer for butterflies and dragonflies. A Perron Road/Trail walking loop back to the beginning of it at the Clarence-Cambridge Boundary Road could be done using the route described to Nine Mile Road and then by going NNW on Nile Mile Road 2.7 km to the Clarence-Cambridge Boundary Road, and then going WSW for 1.7 km on the Clarence-Cambridge Boundary Road to Perron Road/Trail. The entire loop would be 11.3 km. Two somewhat shorter loops could be used as well. By taking Route 100W when the Perron Trail crosses it and going the 3.6 km directly to Nile Mile Road, the loop is reduced to 9.9 km. If you take the first side trail mentioned, about 1.5 km from the starting point above, you can cut across to Route 100W in 1.2 km and reach Nine Mile Road in a further 1.7 km, making the total for this loop a mere 7.9 km. Remember that trail conditions and positions can vary considerably from year to year; and are dependent on weather, water levels and municipal decisions. Larose Forest Loop Directions: From Perron Road at the Clarence-Cambridge Boundary Road, go east on the Clarence-Cambridge Boundary Road for 0.7 km to Bouvier Road. Turn left or NNW into the next site on this route, Bouvier Road North of Clarence-Cambridge Boundary Road.